Buddy is so keen to find a home that I have decided to have a giveaway (plus you guys are all such great blogland friends that I would love to give something back)! If you would like to win Buddy all for yourself, or give him to someone special, leave a comment below by this Sunday and I will draw the names from a hat on Monday 12th January 2009 (NZ time). Postage is for free too. 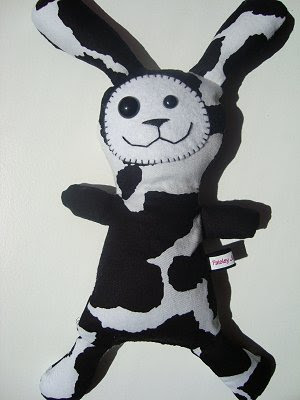 To check out Buddy and more of his friends, visit Paisley Jade's Softie Shop here. Oh He is just ADORABLE!!! He would be a welcome addition to my cuddly family!!! AWESOME Blog btw and I love your softies shop too which I have just been wandering though!!! Oh please please please add me to the freebie friday draw!!!! I promise I will take great care of any softie that may become part of the Bassett family! Juanita (with her fingers tightly crossed for a win!) haha. My daughter would absolutely love this softie. I thoroughly enjoy reading your blog and your craftiness inspires me. Cute giveaway, Kristy! He's an adorable little bunny! Buddy is gorgeous! If I won, I would give him to my nephew Moo Moo because of that gorgeous cow print fabric. Paisley Jade- Thank You so much for the chance to win Buddy. We would give him a great home! I am sure Buddy would love it in japan! aw! he's a little cutie miss paisley! you sew very well! You should give him to someone way overseas so he can go on an OE. What a generous and sweet thing to do! Thanks for inviting me to join the raffle. Buddy is a super cutie and if he comes to our home he'll find lots of other buddies to hang with. :) Happy new year! He is very cute and would make a lovely pressie! So cute! Would make an awesome gift for my wife... pick me, pick me! Buddy is so cute, I would love to give him a home. Oh please oh please can I take him home with me. He is adorable! I'm in Australia, but I know a little poppet in Auckland who would just love him. How many comments would be too many comments and therefore considered rude? Oh he is so lovely - and I have a nephew due any day now ... This is my first time ovcer at your blog so I am going to have a little look around! I wonder if I'll get into trouble for entering once every day..... hmmmmmmm He is such a delightful little chap after all. Count me in please, he is such a cutie! Its still sunday so I hope this counts. Fingers and toes crossed. Your softies are always so cute!!! Please pick me I would love to win! !